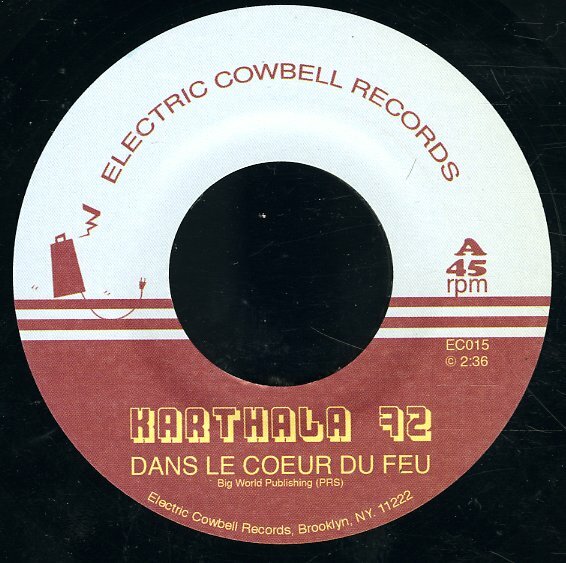 Psych funk meets Afrobeat from Karthala 72 – a great, unique single on the always interesting Electric Cowbell label! "Dans Le Coeur Du Feu" has a tensely percussive rhythm with a heavy, sinister bassline and these eerie, echoey bits of vocal and other errata floating over it all. "Delores" is just as impressive – a clattering, thumping percussion and vaguely eerie mood to spare. © 1996-2019, Dusty Groove, Inc.